Everywhere you look, you’ll find viral quotable wisdom attributed to icons ranging from Abraham Lincoln to Mark Twain, from Cicero to Woody Allen. But more often than not, these attributions are false. 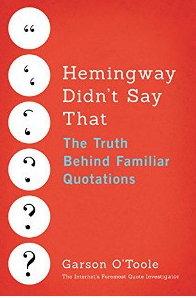 O'Toole (a pen name) is setting the world straight on famous quotations and who really said them. His original research has uncovered hundreds of modern misquotes, which have infected our books, minds and the Internet. Available from Little A imprint ofAmazon Publishing.